Join more than 100 of your fellow benefits professionals in Washington, DC for the 2019 Employers’ Summit on Health Care Costs & Solutions. Thought leaders and employers will come together to share insights and examples of how employers are amplifying their individual and collective impact on employee health care. Attendees will convene for a day and a half of plenary sessions, benchmarking, breakouts and networking events. The summit is your opportunity to come together early in the health care planning cycle and reflect on the prior year’s initiatives, discuss the health care environment, and plan a course of action for 2020 and beyond. Be prepared to share strategies with other employers, to network and learn best practices that you can take home and implement. There will be plenty of time for employer benchmarking on employee engagement, specialty pharmacy, overall cost control and much more. Individuals in a large employer setting who have solely internal-facing corporate HR, benefits, wellness or corporate medical roles for their company’s employees. Limit 3 attendees per company. Strategic Partners of the Institute on Health Care Costs and Solutions. Limit 1 attendee per company. Individuals who have client facing or dual roles, such as sales, marketing, business development or product responsibilities, are not eligible to attend. While only employers are eligible to register for the summit, a small number of industry thought leaders will be invited to help guide the discussion. Rooms are available at the Hyatt Regency Washington, January 22-24, 2019, at a NBGH group rate of $229 per night. Please click here to make your room reservation. Reservations must be made by January 4, 2019. 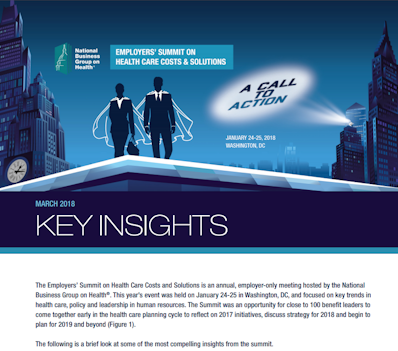 The Employers’ Summit on Health Care Costs and Solutions is an annual, employer-only meeting hosted by the National Business Group on Health®. Last year’s event was held on January 24-25 in Washington, DC, and focused on key trends in health care, policy and leadership in human resources. Close to 100 benefit leaders came together to reflect on 2017 initiatives, discuss strategy for 2018 and begin to plan for 2019 and beyond.